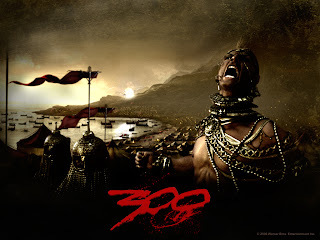 300 is a popular movie right now. It depicts the famous battle in 490 B.C. where 300 Greeks held off an army of Persians. Apart from the blood and gore, this was an interesting period in history. The Persians had conquered the Middle East including Mesopotamia, Egypt, Palestine, and modern Turkey. Where to expand next? To their south lay the Indian Ocean. To their north lay the Gobi Desert and the nomadic lands of Central Asia. To their immediate east lay the Himalayas, while to the southeast lay the riches of India. Their best bet would probably have been to go there. But when they looked to their west, the Mediterranean beckoned. It was a waterway of trade. The Phoenicians and the Greeks competed for the business. Both established colonies in the lands to the west. Syracuse in Sicily was the crown jewel for the Greeks; Carthage in north Africa for the Phoenicians. To sweeten the deal for the Persians, Phoenicia was part of their empire. But what really got things going was when the Greek colonies in Persian territory revolted against the Persians. The Persians crushed the revolt and then decided to conquer Greece. At the same time, Carthage attacked Syracuse in the west. Had the Greeks lost the war, the world would be a far different place now. Meanwhile in the rest of the world, Confucius was nearing the end of his career as a government official in China. The founder of Buddhism was preaching in India. Interesting times. I am currently reading Herodotus. This is the first historian - and one of the most interesting. His history is still the primary source of this era.